Lydia, my favorite mixed-breed dog! I was in shock when I got Lydia’s results from her Wisdom Panel Insights by Mars Veterinary. I’ve always told people she was an Australian shepherd / border collie mix, but that’s not what the test showed. According to the Wisdom Panel Insights DNA test, Lydia’s predominant breed is the Alaskan malamute, with the Old English sheepdog as the second breed. It made absolutely no sense, and I was sure the test was wrong! Since I was in such shock over the results, Dr Angela Hughes, one of the veterinarians at Mars, agreed to talk with me to explain a bit more about the test, and Lydia’s results in particular. Briefly, the way the test works is that they compare the DNA sample against over 300 genetic markers from more than 170 breeds of dogs. The more similar markers there are for a particular breed, the more likely that breed is an ancestor of the dog being tested. If you’re interested in the technical details about how the testing works, visit the Wisdom Panel Insights website for more information. 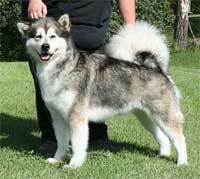 The malamute is the most recent purebred dog in Lydia’s line. In other words, she had more genetic markers matching the malamute than any other dog. The malamute in Lydia’s family tree was probably a grandparent or great grandparent. 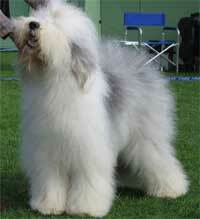 The Old English Sheepdog may go back a bit farther. But (and here’s where I get to say I KNEW IT! 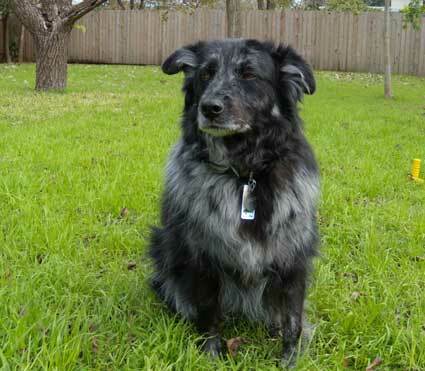 ), Lydia does have some Australian shepherd and border collie in her ancestry as well. The results I got didn’t mention this though because they’re not as strong as the malamute and sheepdog. But, even though she may not be as much Aussie or border collie, some of the genes from these two breeds are more dominant than those of the malamute or sheepdog. 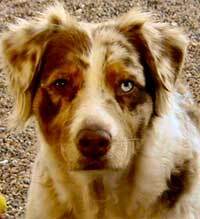 As far as her merle color is concerned, that could be from either the Aussie or the sheepdog. The only bit of Lydia that I can see that might have come from an Alaskan malamute would be her tail. I’ve often wondered where it came from, and knowing she has some malamute in her background explains it. 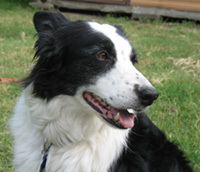 Other than that, she has more Aussie and border collie traits than of the other breeds in her ancestry. In the end though, Lydia is Lydia! And, regardless of her ancestry, I couldn’t love her any more! Thank you to everyone who played along and tried guessing what breeds went into my little mixed-breed dog. As promised, I have a Wisdom Panel Insight Dog DNA test for the person who guessed the right breed. Since nobody guessed the right predominant breed, the DNA test goes to Terry Haas, who guessed Siberian Husky Granted, it’s not a malamute, but it’s pretty close. (but honestly, Terry, do you really see husky or malamute in her?). Thank you to Mars Veterinary for providing me with two Wisdom Panel Insights test – one to do Lydia’s DNA test and one to give away to one of our blog readers. You do know that a canine DNA test is only 85 percent accurate? I would not put much faith in the DNA test until you can get better percentage than that. Well I’ll be! I would never have guessed Siberian if you hadn’t followed up with the tip in saying it was a larger dog and you couldn’t believe it. Does she look like a Siberian (or a Malamute!!!) to me? Not at first glance, but because I know how quickly crossbreeding of pure-breeds can alter their appearance I didn’t really limit myself. Her coat is thick, her ears are half pricked so I took a stab at Sibe! Oh Grace and I are SO excited!!! Thank you Therese! I’ll post some links to pics of Grace (which what I am told she is part Pit and part Black Lab) but many people comment that she looks like a Cattle dog, too…so…more guessing fun??? How awesome! Thank you!!! So where does she get her merle coloring from and her size? It would be interesting for you to try tests from other companies and even the blood test you can have done at the vet (which is supposed to be more accurate). I wonder if the same breeds would show up? I have to agree with Melissa. While it’s fun to speculate on our mixed breed dogs, and I was admittedly tempted to do one on Scooty before she died, I’m skeptical of them. I would love to see how the different companies would weigh in on the same dog. It seems to me the science may have a little ways to go before it’s really reliable. But thanks for the entertainment, Therese. See if you can get any of the other companies to let you test Lydia. Well ain’t that something! I know a lot of people with what we thought were PB BC’s recues and their test cames back with out a smidge of BC. One was a similar shock to yours, it was Akita, Sheltie, Pom. I am going to have to rethink Malumute/Husky on my dog Charlee. That would explain a few things. Coat for one, love for pulling and cold, and I always thought the ears were from being 1/2 cattle dog and that what it said on the shelter papers, but who knows. I really wish the tests were 100 %. Nah, she is BC/ACD if it looks like and acts like it…. I know this is an old post, but hopefully you will see this. I have a dog that looks very much like Lydia. Same colors and same tail. I have always known he was part Australian Shepherd, but have never been able to figure out what he is mixed with. 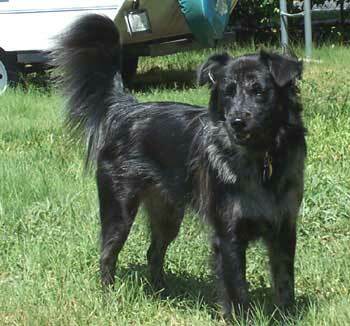 The three breeds I have considered that he may be mixed with are the Newfoundland, the Great Pyrenees and the Malamute. I do not think he looks like a malamute, but he plays similarly to huskies and malamutes and he makes similar vocalizations. He does not have the herding instinct like your Lydia, but he is very intolerant to hot weather. I can send you pics of him if you would like. I am planning to do the Mars DNA test on him now that they have more breeds in their data base. Hi Steff, I did see your post and would love to see what your dog looks like. I’d also be interested to hear what your DNA test shows. I got a test on my dog recently she came back 75 percent Siberian husky and 25 percent malamute. She looks like a purebred Husky but it is hard to differentiate between the two in the first place. How were you able to get additional results on your test? Did the doctor just go through your results and decide there is border collie and aussie? Hi, I have been told that my dog is a old english/malamute mix. Everyone wants to argue with me though, and someday I would love to get a dna test. He is approx 120lbs and a gentle giant. Pics do not illustrate his size well. I wanted to post his pic for you, but not sure how. Many years later and here I am again, having found Lydia’s photo online, thinking how Lydia reminds me of my Moose. I never did get his DNA test done. I was waiting for the DNA tests to improve and meanwhile he passed away. He was a great dog! I would send you photos if I knew how. Previous post: Lydia’s DNA results are in! Next post: It’s a very Merry Flamingo Christmas!